Sell WFC put to earn annualized 15.7% return on option premium or end up buying WFC at long term support level. 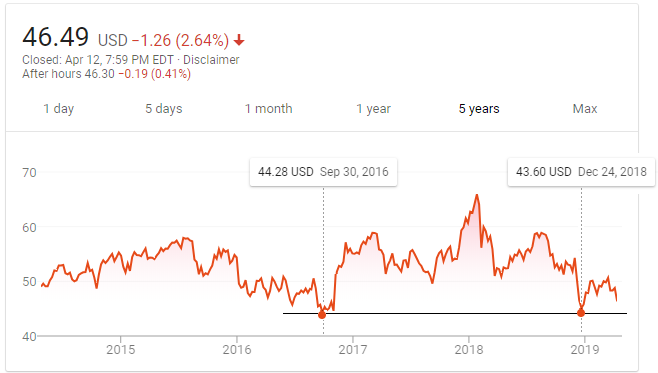 WFC is at multi-year low right now. With CEO replacement around the corner we can expect more positive outcome in getting Fed restriction removed. Wells Fargo (WFC) has stagnated for the past 5 years in a sideways pattern. What is keeping WFC suppressed from growing is Fed's growth restrictions being put in place since Dec 2018 as result of account opening scandal that has plagued WFC since Sep 2016. In order to keep the WFC balance sheet to within 1.95 Trillion USD limit imposed by Federal Reserve, WFC has progressively taken steps like selling short term assets and non-core deposits. However, as time progresses WFC will have to sacrifice growth in core loans and deposit business. Further net interest margin has been impacted because of an unfavorable rate environment as was reflected in the latest Q1 2019 results. WFC has been unable to set any timeline to get Fed growth restrictions off their back. This won't happen until WFC finds an outside replacement for their CEO who has resigned and work on implementing a governance plan to remove the Fed growth restrictions. WFC stock after Q1 2019 results closed at 46.49 on 4/12/2019 which puts it very close to its long term support level of $43.60 level. Sell WFC put strike $45, expiry 5/17/19 for $0.64 (bid as of 4/12/2019 close). If stock bounces off higher from the current lows and the put doesn't get exercised then you will end up making an annualized return of 15.7%. If WFC goes lower then you can end up acquiring WFC at 44.36 which is still a very good price point considering CEO upcoming change will likely increase the probability of Fed restrictions being removed soon. Disclosure: I am/we are long WFC.